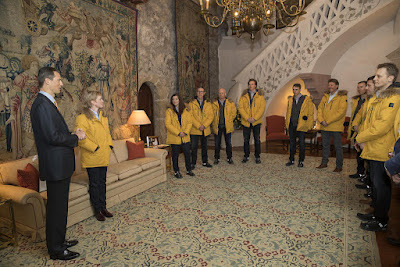 Hereditary Prince Alois officially bid farewell to Liechtenstein's Olympic athletes this week. Three athletes will represent the Principality at the Winter Games in Pyeongchang: Alpine skiers Tina Weirather and Marco Pfiffner as well as cross country skier Martin Vögeli with Liechtenstein's medal hopes certainly laying with Weirather, who won a silver medal at the World Championships last year. With its nine medals in Olympic history, Liechtenstein has, in fact, won more medals per capita than any other nation. Not surprisingly for the only nation to lie entirely within the Alps, all of the medals were won in alpine skiing. The first two medals for Liechtenstein were won at the 1976 Winter Olympics. Hanni Wenzel, who later went on two become a double Olympic champion and is actually the mother of Tina Weirather, won a bronze medal in the giant slalom and Willi Frommelt took another bronze medal in the slalom. At the 1980 Lake Placid Games, Hanni Wenzel won two gold and one silver medal with her brother Andreas winning another silver medal for the Principality. Liechtenstein's athletes took home another three bronze medals at the 1984 and 1988 Olympics through Andreas Wenzel, Ursula Konzett and Paul Frommelt. More pictures of the Hereditary Prince seeing off the athletes at Vaterland. 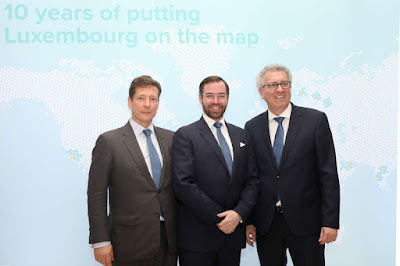 File this under things we missed: On December 14, the Council for Foreign Trade and Investment - consisting of the presidents of the Chamber of Commerce, FEDIL, Luxinnovation and the Chamber of Trades, as well as representatives of various ministries - met under the honorary chairmanship of Hereditary Grand Duke Guillaume at the Ministry of Economy to adopt the action plan of Luxembourg's new economic promotion strategy. More information on the matter at the government website. 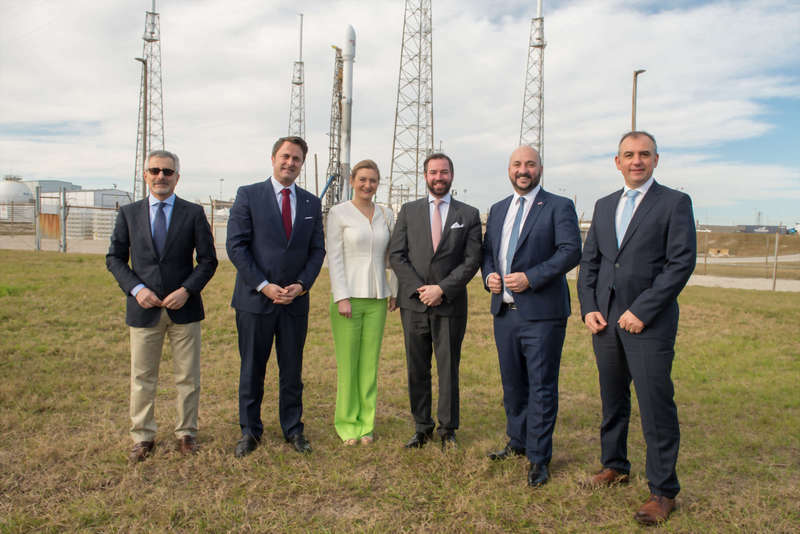 Hereditary Grand Duke Guillaume and Hereditary Grand Duchess Stéphanie visited Florida this week where they witnessed the launch of the first satellite "GovSat 1" at the Cape Canaveral launch base. They worn joined by Prime Minister Xavier Bettel and his Deputy Etienne Schneider for this occasion. "GovSat 1" will be launched later today, at 10:23pm Luxembourg time, aboard a SpaceX’s Falcon 9 rocket. SpaceX was founded by Elon Musk in 2002. 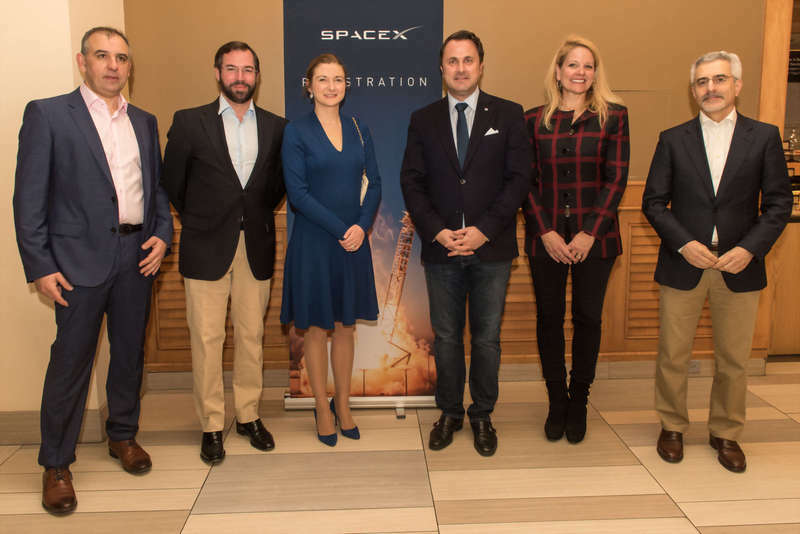 "GovSat" will operate the satellite and is a brand operated by LuxGovSat S.A., a public-private joint venture between the Luxembourg government and SES, the world’s leading satellite operator located in Betzdorf, Luxembourg. Its mission is to provide secure and reliable satellite communication capabilities for both military and civilian purposes to meet growing demands in the institutional and defense fields. While part of the capacity of the GovSat-1 satellite will be used to meet Luxembourg’s requirements for military-frequency satellite communications, the plan is to resell GovSat-1’s additional communication capabilities to allied and partner countries as well as to international organisations (notably Nato and the EU). More pictures from the cour and the government website. Loads more information at Wort. 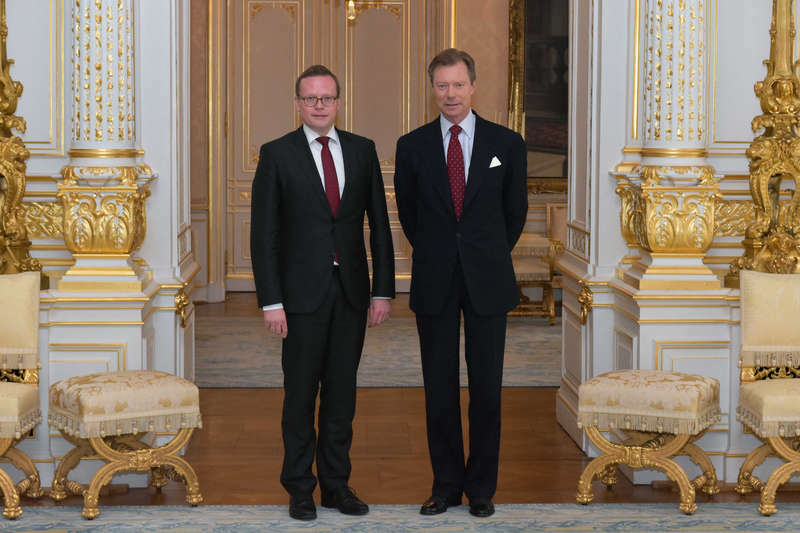 Earlier today, Grand Duke Henri received in audience Alexander Miesen, President of Parliament of the German-speaking Community of Belgium, at the palais. The German-speaking Community is one of the three federal communities of Belgium with its speakers located in Eastern Belgium around the city of Eupen. 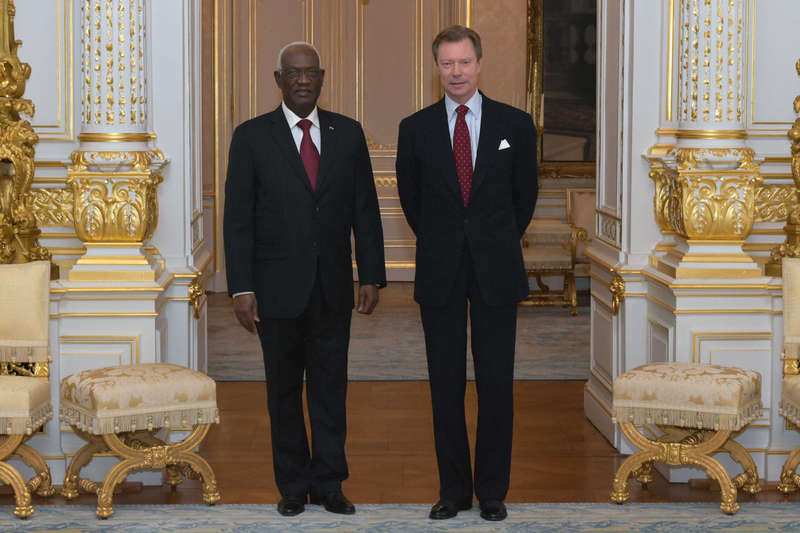 In a second audience, the Grand Duke also welcomed Dama Dramani, President of the National Assembly of Togo, at the palais. Just like Mr Miesen, His Excellency was on a working visit to the Grand Duchy today. Together with the Les Amis des Musées d'Art et d'Histoire Luxembourg, one of her patronages, Hereditary Grand Duchess Stéphanie made a private visit to the "César: La Rétrospective" exhibition at the Centre Pompidou in Paris earlier this month. The "Friends of the Museums of Art and History Luxembourg" shared a picture on their Instagram. 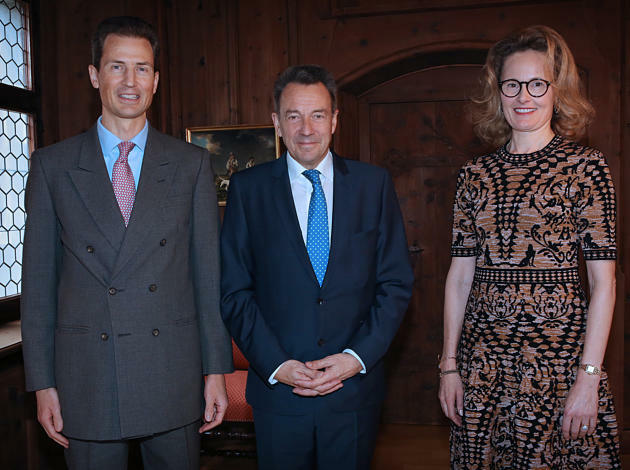 On the 22nd, Hereditary Prince Alois and Hereditary Princess Sophie welcomed Peter Maurer, who is the President of the International Committee of the Red Cross (ICRC), to stay for a courtesy visit. Maurer was on his way to attend World Economic Forum (WEF) events in Davos. Liechtenstein partners extensively with the ICRC on International Humanitarian Cooperation and Development, with the goals of improving international humanitarian law and providing humanitarian aid. On the matter of the cooperation, Maurer noted: "Liechtenstein is an important and, above all, reliable partner, with its strong support we are able to help people in areas suffering from the effects of protracted conflicts that are not featured in the headlines on a daily basis." A little more from Vaterland. 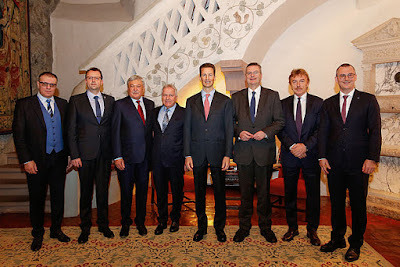 On Thursday, Hereditary Prince Alois opened the Principality's parliament, after walking there together's with the country's lawmakers. During the opening the Hereditary Prince, who was appointed his father's regent in 2004, gave his annual so-called throne speech despite there not being an actual throne to sit on. In his speech Hereditary Prince Alois focused on the financing of assistance and care of the elderly. The transcript of the full speech in German can be found here. 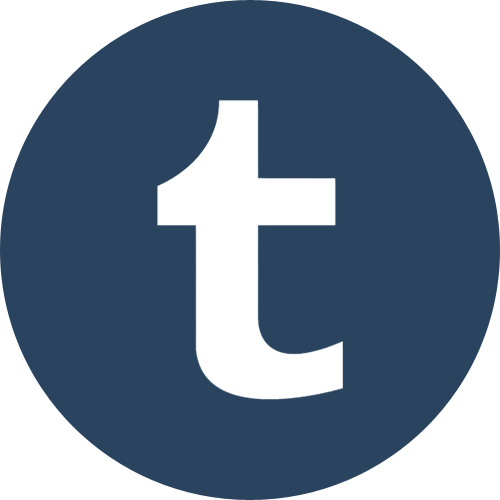 A gallery of visuals is available at Vaterland. Volksblatt has the audio of the speech, while 1 FL TV provides a video. 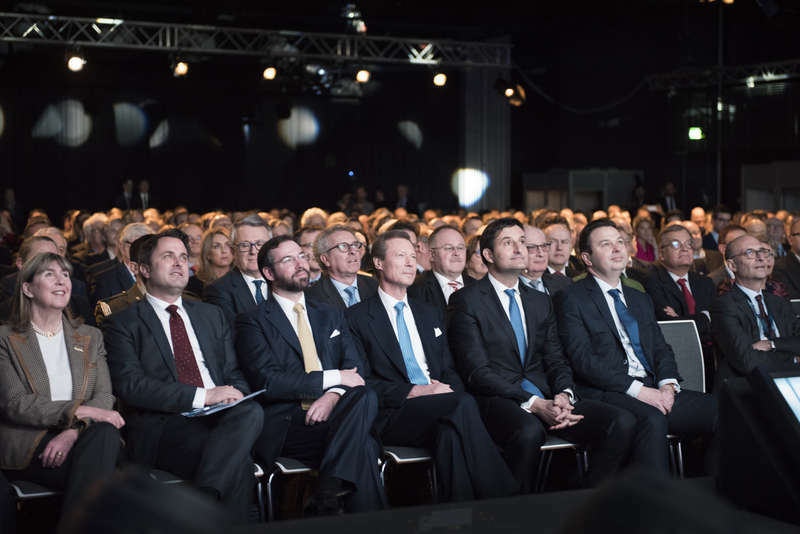 On Thursday this week, Grand Duke Henri and Hereditary Grand Duke Guillaume were on hand to celebrate the 100th anniversary of the Fédération des Industriels Luxembourgeois, the association of industrialists in Luxembourg. Way more information about the event as well as more pictures are available at Tageblatt. Turns out, Prince Max was also among the numerous royals who flocked to Davos this week. 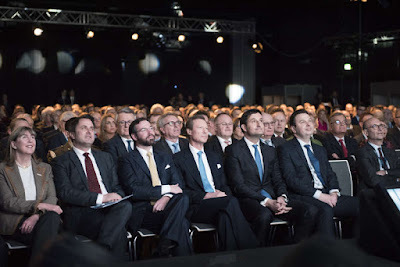 Apart from some other events surely, the CEO of the LGT Group and son of Prince Hans-Adam II was a guest at the Swarovski Dinner and film preview during the World Economic Forum on Wednesday, January 24. He's half-pictured on the left in the photo above. 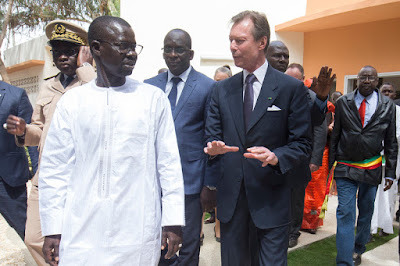 On the third, and final, day of the official visit to Senegal, Grand Duke Henri visited the region of Saint-Louis with Prime Minister Mahammed Bon Abdallah Dionne. 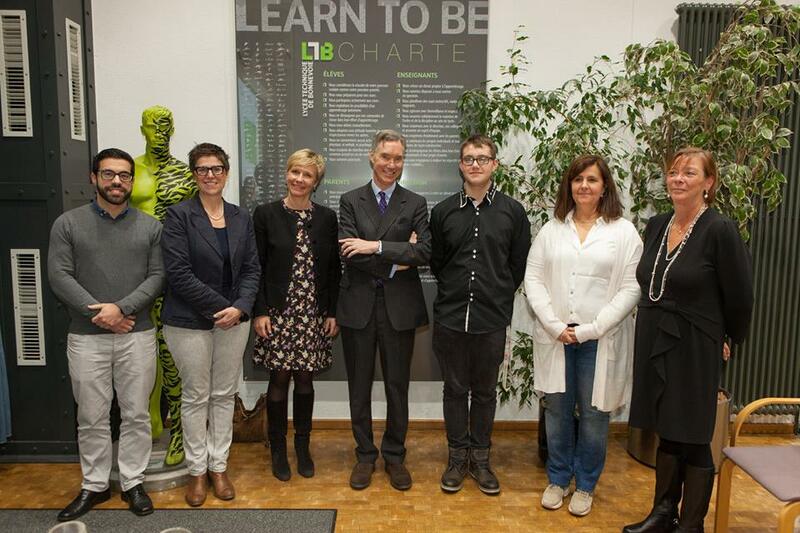 Romain Schneider, Carole Dieschbourg and Francine Closener were also present for the visit. Saint-Louis Governor Alioune Aïdara Niang welcomed the entourage, along with the Minister of Hydraulics and Sanitation and Mayor of Saint-Louis, Mansour Faye, and the Minister of Vocational Training, Apprenticeship and Crafts, Mamadou Talla. The trip to the region included a tour of the Saint-Louis Vocational Training Center (Centre de formation professionnelle de Saint-Louis). The Grand Duchy has been an active supporter of vocational training opportunities in Senegal since 2003. After this, the group visited the Regional Hospital Center (Centre hospitalier régional) of Saint-Louis with the Minister of Health and Social Action, Abdoulaye Diouf Sarr. Luxembourg has supported the hospital as well, particularly through an emergency management system. To round off the day, the visitors from Luxembourg stopped by the district of Guet-Ndar to view the protective measures that have been implemented to prevent further coastal erosion along the Langue de Barberie. The link with the full itinerary, as well as the official photos. 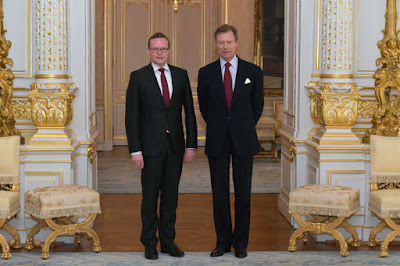 The Cour Twitter account also has photos of the Grand Duke's departure. For the first time, Hereditary Prince Alois will be present at the World Economic Forum (WEF) in Davos, joining Prime Minister Adrian Hasler. 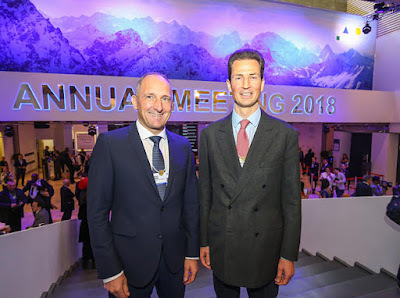 The Hereditary Prince and the Prime Minister have been invited by WEF founder and Executive Chairman Klaus Schwab to attend a traditional dinner on the 23rd. Additionally, the Minister of Foreign Affairs, Education and Culture, Aurelia Frick, has been invited by the President of the Swiss Confederation, Alain Berset, to participate in the Conference of Ministers of Culture in honor of the European Year of Cultural Heritage. She will also join a panel discussing "Women, Work and Wages: Closing the Gender Gap" on Thursday. A little more information at Vaterland. On Day 2 of the official visit to Senegal, Grand Duke Henri participated in a number of events, beginning with an economic forum in Diamniadio, a newly developed urban center around 30 kilometers outside of Senegal's capital of Dakar. The forum was jointly organized by the Grand Duchy and the Agence sénégalaise pour la promotion des investissements et des grands travaux (APIX). 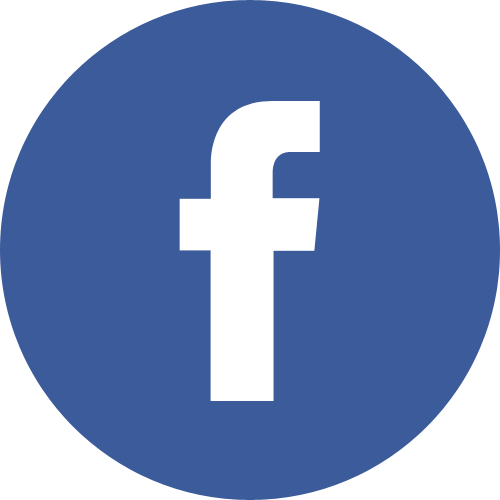 The Grand Duke's opening remarks may be found here. Afterward, the Grand Duke visited the Regional Center for Health and Development in West Africa ENDA-Santé (which is working in partnership with the Luxembourg-based NGO Stop Aids Now). There the Grand Duke, with Romain Schneider, unveiled a commemorative plaque. The two organizations are now embarking on the third phase of the project "Frontiers and vulnerabilities to HIV / AIDS in West Africa." Following this, Grand Duke Henri was joined by Romain Schneider and Francine Closener on a visit to Kermel Market, which was rebuilt with the support of the Grand Duchy and the European Commission following a fire in 1993. 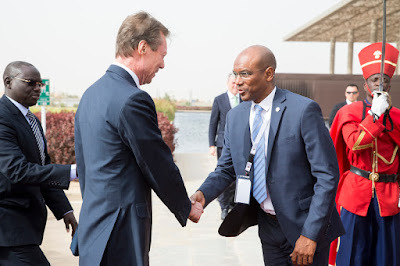 The Grand Duke then joined former President Abdou Diouf, and his wife Élisabeth Diouf for a private lunch. 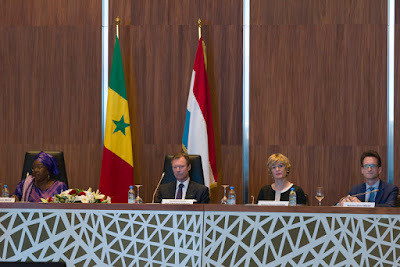 Minister Romain Schneider, Minister Carole Dieschbourg, and Secretary of State Francine Closener also met with their Senegalese counterparts for bilateral talks. 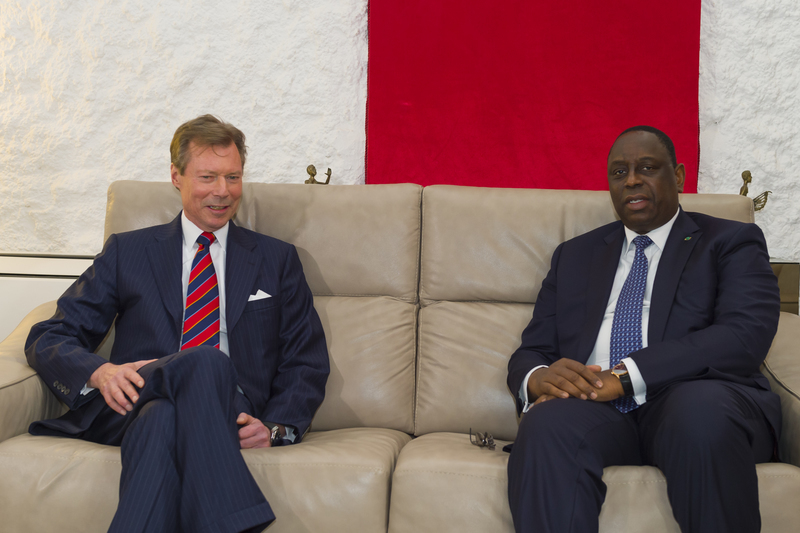 During the evening, Grand Duke Henri was welcomed by current President Macky Sall at the presidential palace for an interview, with the Ministers and the Secretary of State also in attendance for meetings. 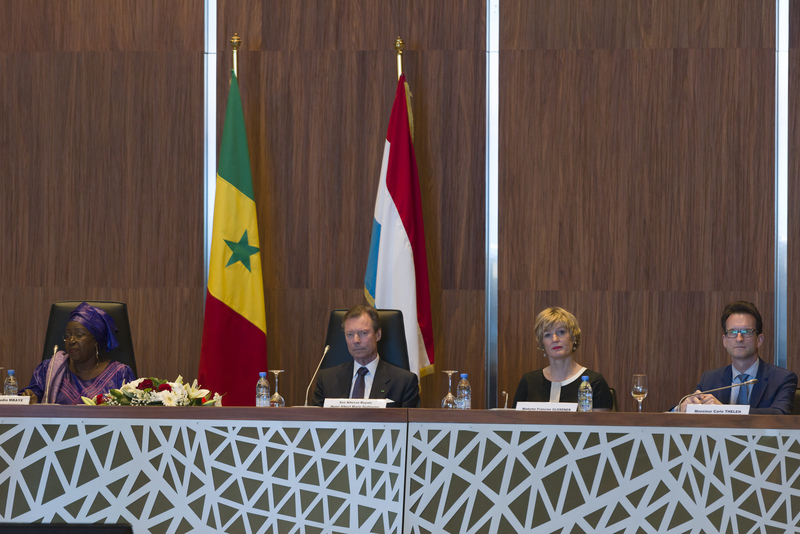 The 4th Indicative Cooperation Program between Luxembourg and Senegal was signed during this time. To round off the day, the Grand Duke attended a gala dinner hosted by President Macky Sall in his honor. The Grand Duke's toast can be found here. The full itinerary is provided here, with more photos available here. 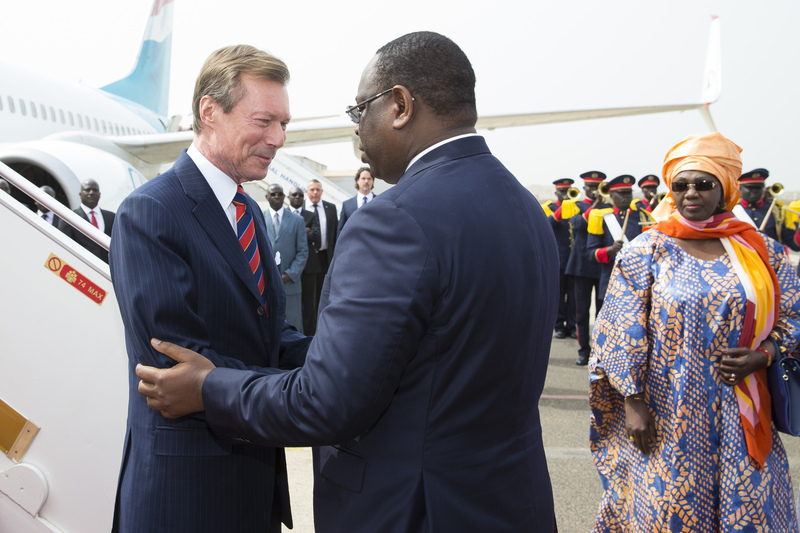 Earlier today, Grand Duke Henri arrived in Senegal for his three day long official visit. In the early afternoon, the Grand Duke and his accompanying delegation was welcomed at the Léopold Sédar Senghor military airport in Dakar by the President of the Republic of Senegal Macky Sall with several other officials also present. Subsequently, the Grand Duke, accompanied by Ministers Romain Schneider, Carole Dieschbourg, Francine Closener and Senegal's Minister of Culture, Abdou Latif Coulibaly, visited the island of Gorée, a small island just south of Cape Verde Peninsula that was the site of one of the earliest European settlements in Western Africa and long served as an outpost for slave and other trading. The island has been a UNESCO World Heritage Site since 1978. During the visit, Luxembourg's head of state was elevated to the rank of pilgrim-ambassador of the memory of Gorée, the highest distinction of the island, by local mayor Augustine Emmanuel Senghor. 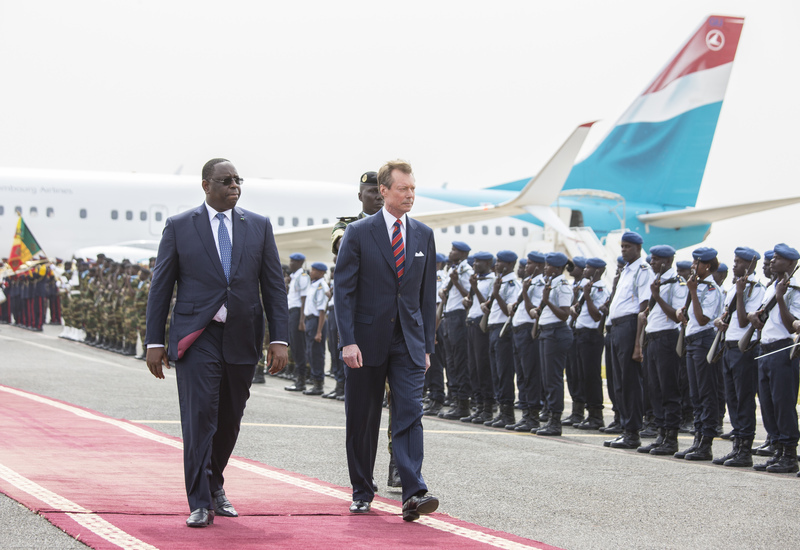 Back in the capital Dakar, a reception in the presence of Grand Duke Henri, Romain Schneider, Carole Dieschbourg, Francine Closener, the official and economic delegations and the Luxembourg community in Senegal closed the first day of the official visit. More pictures and videos are available at the government website, Tageblatt, Wort and RTL. 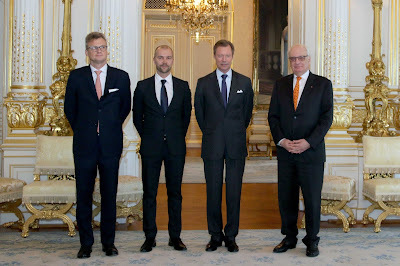 Earlier today, Grand Duke Henri was on hand to hand out the Prix Grand-Duc Adolphe. This year's award was given to Miika Heinonen, a Finnish born photographer and visual artist who lives and works in Luxembourg, for his work "Belief System type 2" showing the Grand Duchy's synagogue, which you can find at Wort. Also present for the occasion were the Secretary of State of Culture Guy Arendt and the president of the Cercle Artistique de Luxembourg (CAL), Marc Hostert. 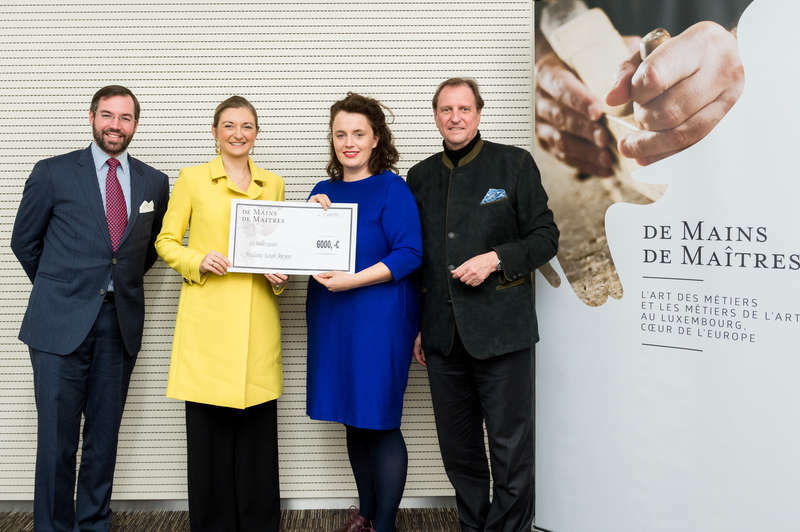 Since its creation in 1902 the Prix Grand-Duc Adolphe is awarded to artists who exhibit at the Salon Artistique of the Cercle artistique de Luxembourg. Easily noticeable, the award was named for and created by the former Grand Duke Adolph, the great-great grandfather of the current Grand Duke, on the initiative of his wife Grand Duchess Adelheid-Marie, an avid painter herself. 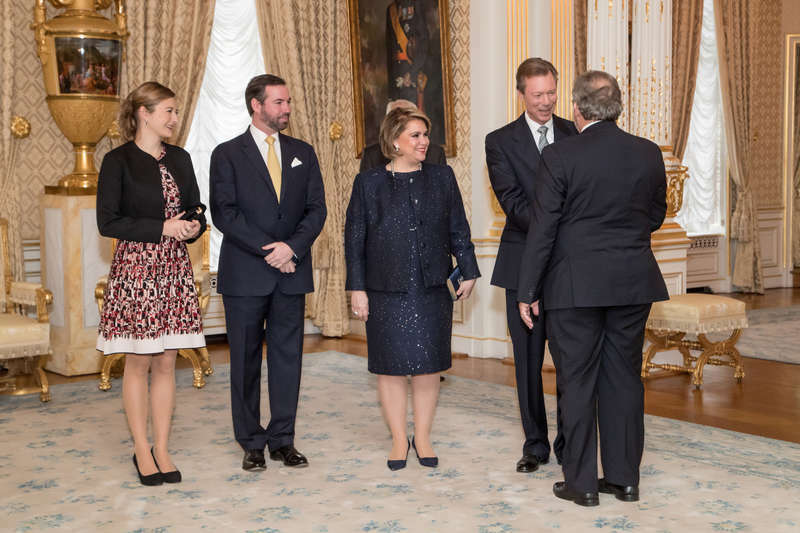 Grand Duchess Maria Teresa is the patron of the award and while she was scheduled to hand out the Prix today, she did not for an undisclosed reason. Earlier today, Hereditary Grand Duke Guillaume and Hereditary Grand Duchess Stéphanie awarded the first De Mains des Maîtres scholarship to artist Sarah Meyeers. The exhibition "Of Master Hand" highlights some 60 young craftsmen and art designers from the Grand Duchy and the Grand Region. Its aim is to note the country's young talented creatives and to highlight the beauty and importance of the transfer of know-how to younger generations. 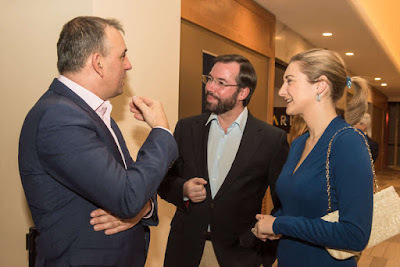 The idea behind the the exhibition comes from no other than the Hereditary Grand Duke and Hereditary Grand Duchess themselves who launched the initiative together with the Chamber of Trade and the Ministries of Economy and Culture. Profits from the exhibition that has already been shown in Luxembourg, Paris as well as Brussels and sales of the art works has been put forward into a scholarship programme. 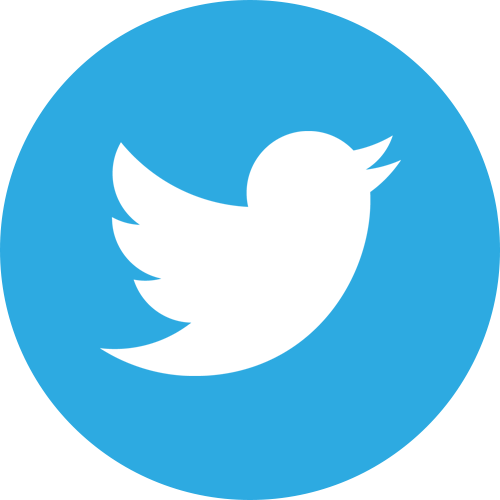 For more information, have a look at the website of the cour. On Tuesday, Grand Duke Henri received in audience five new ambassadors to Luxembourg. Ammo Aziza Baroud of Chad, Mohamed Issa Hamad Abushahab of the United Arab Emirates, Abdulrahman bin Mohammed Sulaiman Al-Khulaifi of Qatar, Nestor Gabriele Bellavite Terceros of Bolivia and Joseph E. Sokoine of Tanzania all presented their letters of credence to the Grand Duke. Prince Robert has given an interview to Point de Vue, welcoming the magazine into his restaurant in Paris, Le Clarence. He discusses his family's history with and love for France, in addition to their ongoing participation in the worlds of fine foods, fine art, and fine wines. He talks a little about his childhood exploration of Château Haut-Brion, which led to a lifelong love for the family estate and their work in cultivating wine. 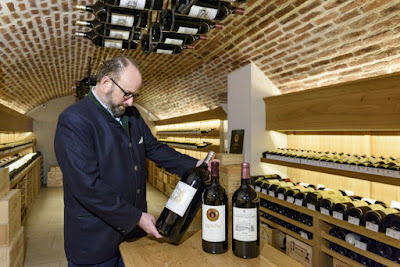 Prince Robert also shares some history of Hôtel Dillon, the 19th-century townhouse that is now the home of Le Clarence and the wine store La Cave du Château, and the restoration work required to return it to its former elegance. The full interview, with video, here. Photos of the competitions from Day 1 and Day 2. On January 15th, Hereditary Prince Alois welcomed Carmelo Abela, the Minister of Foreign Affairs and Trade Promotion in Malta, at Schloss Vaduz. 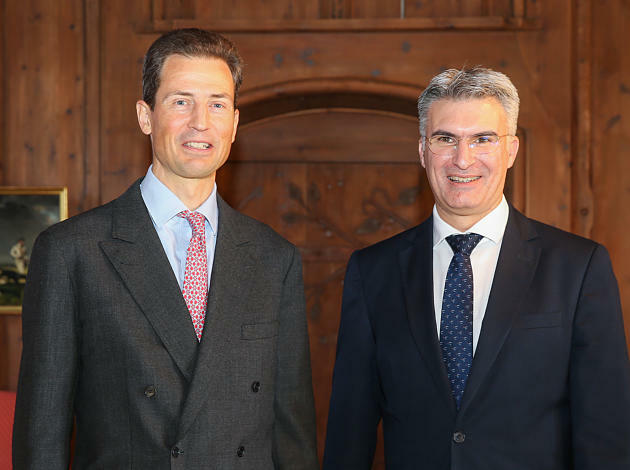 Foreign Minister Abela also met with Liechtenstein's Minister of Foreign Affairs, Aurelia Frick. Among the focuses of the meetings were global migration and developments within the European Union. Afterwards, Foreign Minister Frick accompanied Foreign Minister Abela to the European Year of Cultural Heritage events at Gutenberg Castle in Balzers. 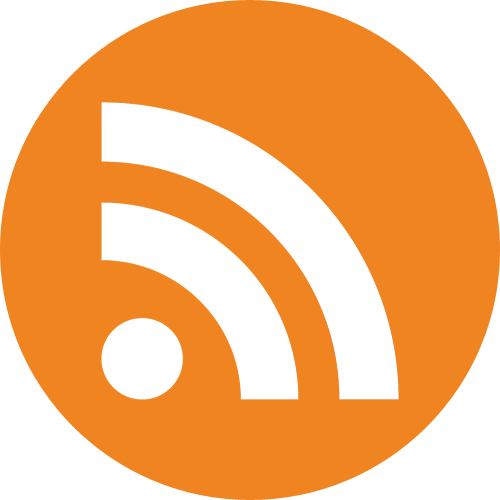 A little more information at Vaterland. Some more photos of the Foreign Minister's visit to Liechtenstein, including photos with the Hereditary Prince, at his Twitter account. Turns out, Prince Hans-Adam II, Princess Marie, Hereditary Prince Alois and Hereditary Princess Sophie were joined by a few additional family members for the New Year's Reception at Schloss Vaduz in Thursday. 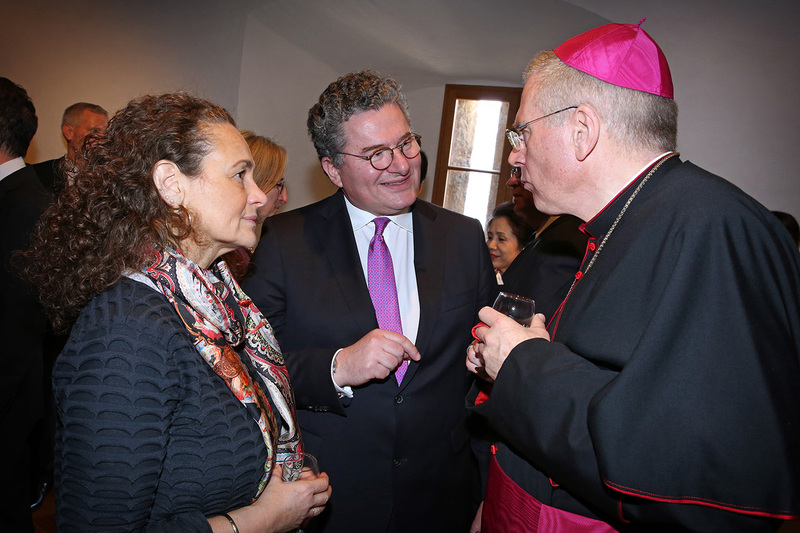 Prince Nikolaus as well as Prince Stefan, new non-resident ambassador to the Holy See, and his wife Princess Florentine were in attendance as well. I also spied Prince Michael and Princess Hildegard among the guests arriving for the reception. On the 10th at Schloss Vaduz, Hereditary Prince Alois welcomed members of the Central European Football Associations, which is being hosted by the Liechtensteiner Fussballverband (Liechtenstein Football Association, or LFV) this year for the first time. 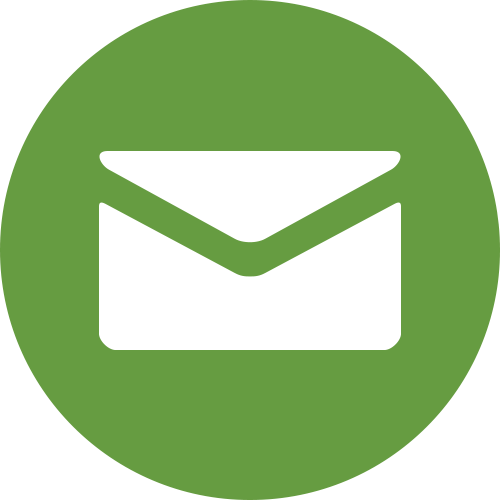 The Central European Football Associations include the following countries: Austria, the Czech Republic, Hungary, Liechtenstein, Poland, and Slovakia. Liechtenstein was recently added, with President Hugo Quaderer's signing of a joint agreement. A little more from Radio Liechtenstein. And now the 2018 New Year's receptions in Liechtenstein have rolled around! 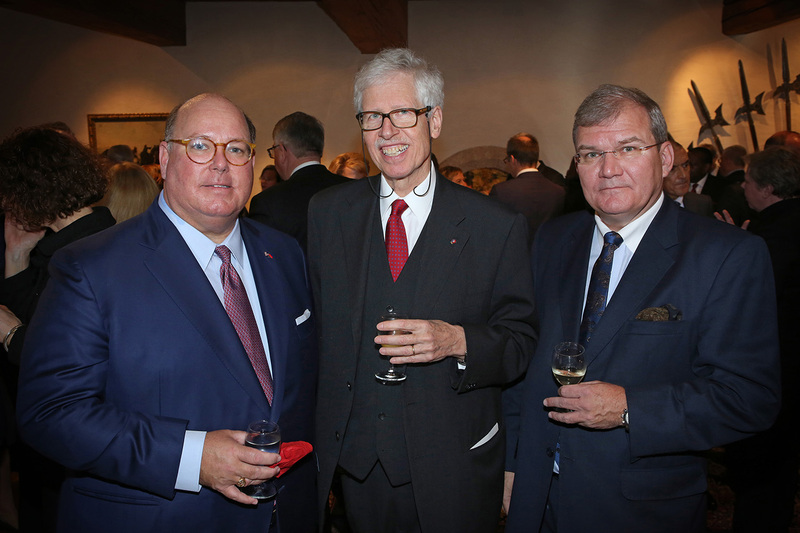 The two-part event on January 11th saw 562 guests welcomed to Schloss Vaduz. (This was slightly lower than the record of 580 people in 2012, but still an impressive turnout for the Princely family to greet.) The morning reception welcomed 172 representatives of the Diplomatic Corps, from 70 nations, while the afternoon reception saw 390 attendees. The New Year's event has been held in two parts since 2012. For the receptions from 2017 and 2016, see here and here. Information here, and the full video here. 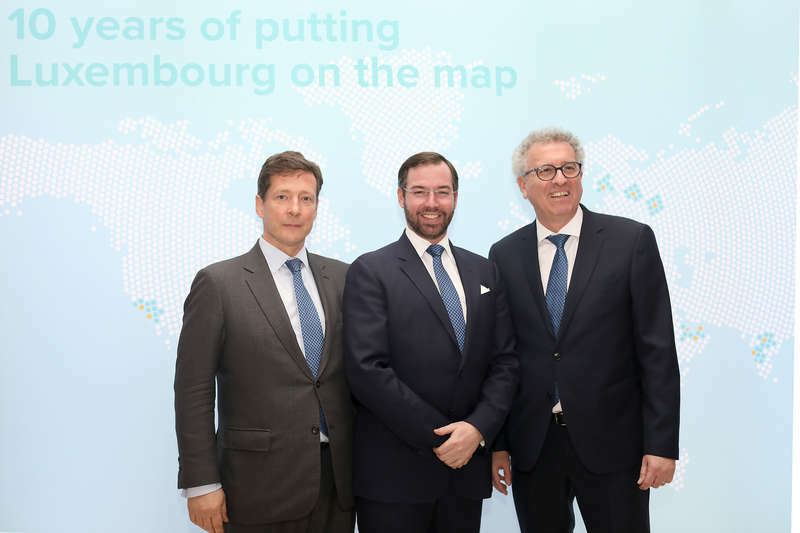 Yesterday, Hereditary Grand Duke Guillaume was on hand to celebrate the 10th anniversary of Luxembourg for Finance. The agency was founded as a public/private partnership for the development and promotion of Luxembourg as a financial centre. At a press conference held on the occasion Finance Minister Pierre Gramegna said, "As a public-private partnership, LFF can convey messages with a common voice, and thus a much stronger voice than each of the shareholders of LFF would have individually. Over the last 10 years, LFF has been putting into practice a unique approach, which has been developing a dialogue and a lasting relationship rather than focusing on short term results.” The Hereditary Grand Duke has been a long-time ambassador for Luxembourg for Finance often joining them on their missions abroad. Other pictures of the evening at Tageblatt and the cour. 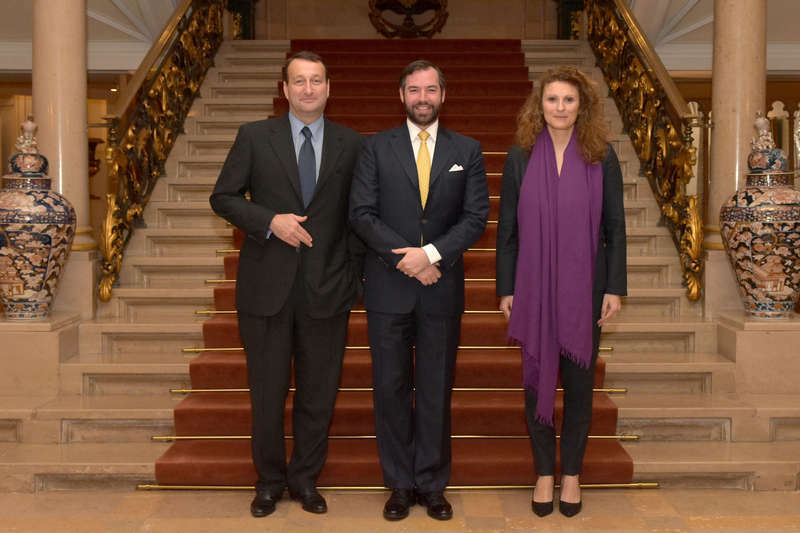 Yesterday and today, Grand Duke Henri and Grand Duchess Maria Teresa held the official new year's receptions at the palais grand-ducal. 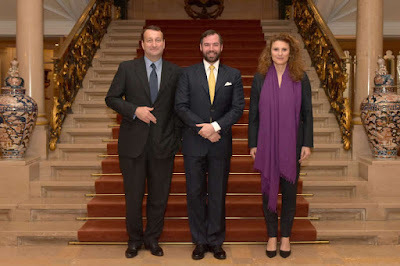 They were joined by the Hereditary Grand Duke and Hereditary Grand Duchess for the occasions. First off yesterday, they received the president and the bureau of members of the Chamber of Deputies before meeting the Prime Minister and the members of government. This was followed by receptions for the president and the members of the Council of State and national authorities as well as diplomatic corps and members of the European institutions today. While another picture and a video of yesterday are available, there doesn't seem to be any visuals of today yet. The other day, Prince Guillaume paid a visit to the Lycée technique de Bonnevoie for the signature of a partnership between the school and the foundation Mérite Jeunesse Luxembourg. The Mérite Jeunesse an organisation and award similiar to The Duke of Edinburgh's Award. 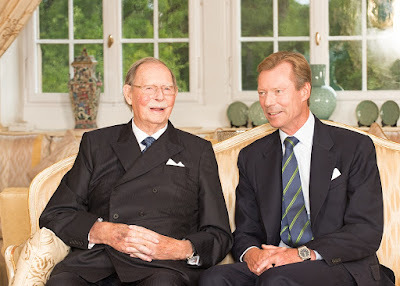 Uncle Guillaume is the president of the organisation while his father, the Grand Duke Jean, is the patron. More pictures of the visit on Facebook. On the 6th of January, Princess Isabelle (wife of Prince Philipp) attended the funeral of Prince François of France, Count of Clermont, who passed away on December 30th at the age of 56. The funeral was held at the traditional burial place for members of the Orléans family, Chapelle royale de Dreux. Also present were members of the Orléans family including the late Prince François's parents Henri d'Orleans and Duchess Marie-Thérèse of Württemberg; his elder sister Marie Isabelle (who is married to Prince Gundakar of Liechtenstein); his brothers Prince Jean, Duke of Vendôme, and Prince Eudes, Duke of Angoulême; the Duke of Chartres; the Duke of Anjou; Princess Maria Pia of Italy; and Archduke Michael of Austria, among others. More information at Paris Match. 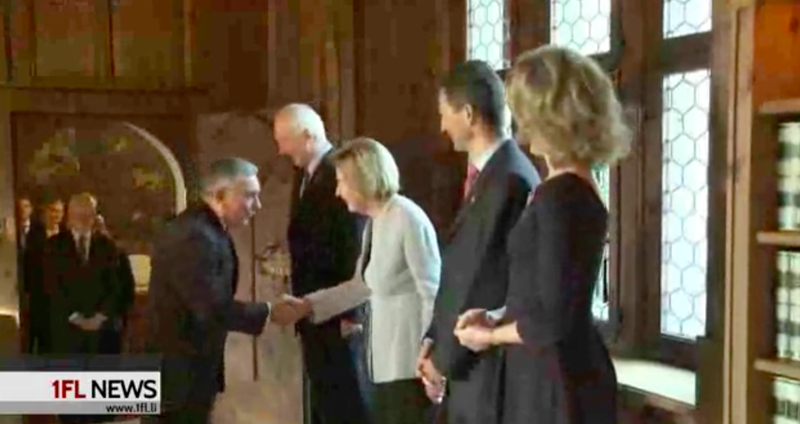 Hereditary Prince Alois was in attendance at a celebration that honored 800 years of the city of Feldkirch, Austria (located in the state of Voralberg, on the border with both Switzerland and Liechtenstein). The event, which was held at Feldkirch's Montforthaus, included a performance of Beethoven's "Ode to Joy" by the Feldkirch City Orchestra and also featured presentations that highlighted the city's rich history and its future opportunities. A subtle feature of the occasion might be the carefully preserved 800-year-old town wall, which sits on the north side of the Montforthaus. 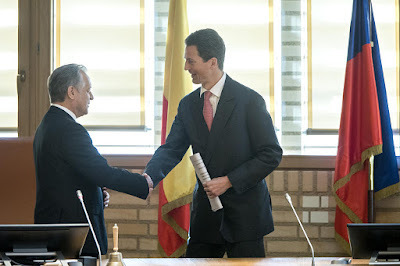 In addition to Alois, a number of other dignitaries were present, including members of the Federal Council, several regional ministers, and mayors from a number of surrounding municipal areas. A little more information about the festivities here. 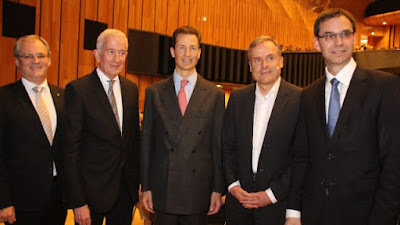 Hereditary Prince Alois has given the traditional new year's interview to Liechtenstein's newspaper Volksblatt (and presumably also to Vaterland) while his father Fürst Hans-Adam II spoke to the country's only radio station, Radio Liechtenstein. 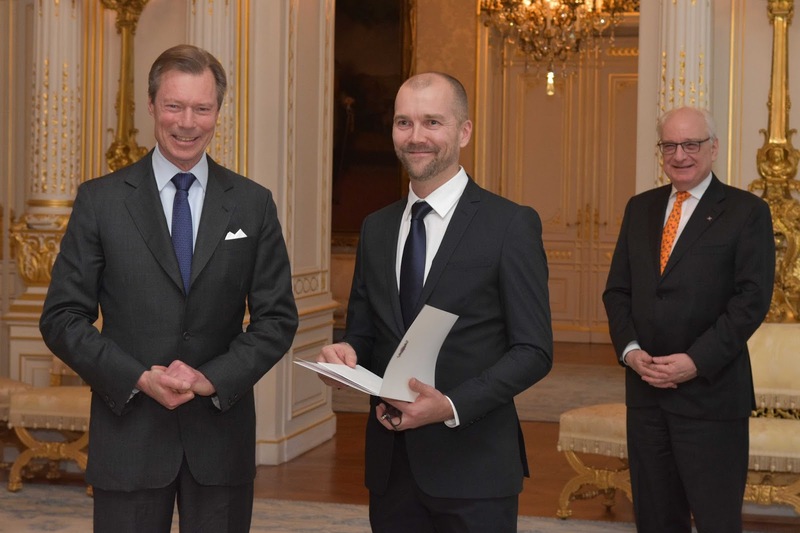 In his interview, which is available online under the previous link, the Prince Hans-Adam expressed his confidence in the new year, "We never did as well before, both domestically and internationally." According to the Fürst, the Principality's sovereignity is protected by being a member of international organisations, the people are well educated and innovative, new companies that are internationally competitive are founded each year - so it is only right to be optimistic about the country's future. The interview with Hereditary Prince Alois isn't available online in its entirety. He spoke about the country's 300th anniversary next year, the challenges faced by the government and what he thinks about a possible deepening of the Rhine river, a Muslim burial ground in the country and the women's quota. Ahead of his 97th birthday tomorrow, the cour grand-ducale has released a new picture of Grand Duke Jean together with his oldest son Grand Duke Henri. Grand Duke Jean was born on January 5, 1921, at Château de Berg as the first child of Grand Duchess Charlotte and Prince Felix. He ascended to the Luxembourgish throne in 1964 and abdicated in favour of the current Grand Duke in the year 2000. For more on his eventful life, have a look at our Luxarazzi 101 about him. There is an additional one focusing on his life in World War II. Happy New Year - here's to a happy, healthy and successful 2018! Let's start the new year with a look back at all the glittery Luxarazzi tiara appearances of last year. But first: Your favourite Luxarazzi gala appearance 2017, no-tiara division. I can't say that it was a close race as Hereditary Grand Duchess Stéphanie's appearance at the Cannes Film Festival won with almost a third of all votes. Can't say I blame you - Stéphanie's white Ralph Lauren gown and a new pair of massive earrings may just be one of her most stunning outfits ever. 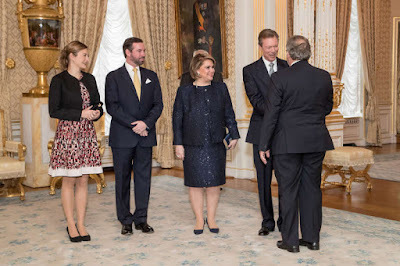 In second place came Grand Duchess Maria Teresa at the wedding of Princess Marie-Gabrielle, with the same dress also worn at the Sandhurst dinner for Prince Sébastien, and Princess Claire (in Denis Durand) also in Cannes came in third. Now onto the tiaras (fromt left to right): Grand Duchess Maria Teresa (in Yves Dooms and the Belgian Scroll Tirara) at the national day gala; Grand Duchess Maria Teresa (in Yves Dooms and the Belgian Scroll Tiara); Grand Duchess Maria Teresa (in Yves Saint Laurent and the Belgian Scroll Tiara) at the Norwergian birthday celebrations; Hereditary Grand Duchess Stéphanie (in Elie Saab and the Amethysts) at the national day gala; Hereditary Grand Duchess Stéphanie (in her Diamond Butterfly Tiara) at the state visit; Hereditary Grand Duchess Stéphanie (in the Grand Duchess Adelaide Tiara) at the Norwergian birthday bash; Princess Alexandra (in the Chaumet Diamond and Pearl Choker Tiara) in Japan. Which is your favourite gala appearance of 2017?